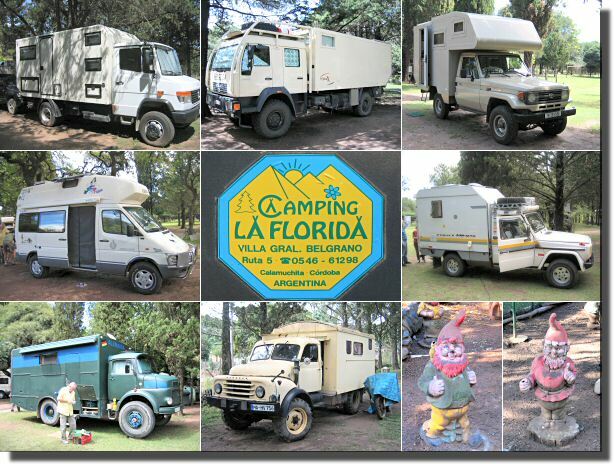 This web page comes to you from the very German Camping La Florida on Ruta 5 just outside Villa Gral. Belgrano . Unless you have a good road map of Argentina you probably won't find Villa Gral. Belgrano, but many overlanders in South America do. There are several reasons to come to Camping La Florida . Firstly it is a fine campsite in a very attractive part of Argentina. Secondly you can (for about one Euro per day) leave your vehicle here for many months in relative safety. Thirdly you can enjoy a splendid three hour barbecue most Sundays and finally you can admire the owner's fine selection of gnomes. The campsite is well signed directly off Ruta 5 at S31.973430 W64.544558. If you want to enquire about leaving your vehicle here, you can contact Ralf and Bettina Lage by e-mail (preferably in German). Among the interesting vehicles parked here is the 4x4 Mercedes 815D Woelcke vehicle seen at Ushuaia (top, left), a nine metre long monster MAN truck with a Unicat (Terra/Cross)body (top, centre) and a Toyota Landcruiser with a Langer & Bock body (top, right). Home - This page last changed on 2009-06-01.